Global space agencies have prioritized additive manufacturing, also known as 3D printing, as a technology with the potential to transform the way space missions are put together. But what still needs to be done to ensure 3D-printed products are genuinely space-ready? By building up a part in layers instead of the traditional process of cutting away bulk material, more can be done with less: extremely complex geometries can be created using reduced amounts of material and energy, and in fewer manufacturing steps. Using Additive Manufacturing (AM), hardware can be produced directly from computer-aided design models with minimal tooling. AM is now being used to build models, prototypes, tooling, and produce parts in plastic, metal, ceramic, and composite materials. The potential for space is indeed vast: imagine missions reaching orbit that then print themselves particularly delicate instruments that would never have survived the turbulent flight up through the atmosphere. Or planetary surface missions that utilise local materials for building. Redesigning existing high-performance parts considering the possibilities offered by AM is a promising means of assessing the state-of-the-art. For example, ESA engineers teamed up with their counterparts at Netherlands research institute TNO to perform this redesign exercise with a 3D-printed mirror, a crucial piece of the Tropospheric Monitoring Instrument (Tropomi) atmospheric spectrometer instrument set to fly on ESA’s Sentinel-5P mission in 2016. The Dutch-developed Tropomi operates by sifting out particular spectral fingerprints from light that has passed through Earth’s atmosphere, in order to identify trace gases. To do so, Tropomi requires a pair of precisely distorted mirrors set up to form an ‘optical cavity’ to focus incoming light sharply into a split in the instrument, leading to a selection of light-splitting gratings. “This represents a demanding target for AM reproduction, because the mirror’s precise optical quality needed to be reproduced as well,” explains Laurent Pambaguian of ESA’s Materials Technology Section, coordinating Agency AM research. The resulting part was streamlined, with unnecessary mass removed. In the event it weighed in at just 127.7 grams, with the same coating. Tropomi’s design has already been frozen, so the original mirror design is the one that will make it to orbit, but this trial shows the mass-saving potential for follow-up instruments in future. Before 3D-printed hardware can be employed routinely in space missions, however, there is still work to be done. “The biggest challenge is having to start from scratch on developing the qualification and verification routes for such materials,” explains Tommaso Ghidini, Head of ESA’s ‎ Materials Technology Section. The availability of AM parts is likely to have a broad impact on overall mission design. A new project supported through ESA’s Clean Space initiative aims to study the system-level effect on factors such as mission mass, cost, lead time and environmental impact. Clean Space, tasked with reducing the space industry’s environmental impacts on Earth and space, has an interest in AM due to its potential for reducing mission mass and energy budgets. The study will apply AM technologies to satellite design, ranking the satellite elements where AM holds the greatest potential, redesigning key parts and highlighting the current AM technology maturity and remaining limitations. 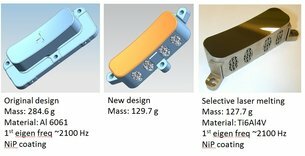 Experts will be gathering at ESA’s technical centre in Noordwijk, the Netherlands, on 28–29 October for a dedicated workshop on Additive Manufacturing for Space Applications to discuss the complete AM development cycle and promising early applications of 3D-printed parts.